HTC M8 seems to get closer and closer to us. After the constant leakage of the benchmark and release data, we got even better news: recently this device has been certified by the Wi-Fi Alliance. In accordance with past convention, this means that this HTC’s new model of flagship will likely be officially released in the near future. 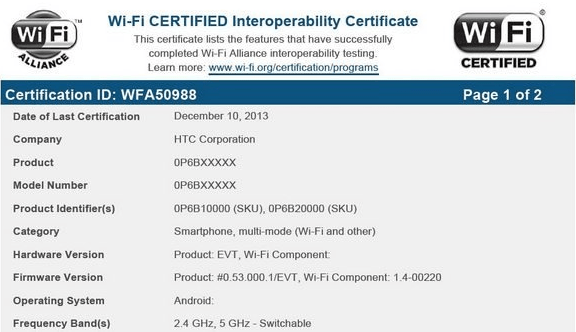 This time, the Wi-Fi Alliance certificated HTC M8 did not disclose its official name in the official announced document. But from the important information that this device is attached to 0P6BXXX platform, we also can determine that this device is the rumored HTC M8. The information that Wi-Fi Allinace published is very limited and the only things we can make sure are that this device supports dual-band Wi-Fi and it is an Android powered smartphone. According to the previous obtained information, HTC M8 will be equipped with 5.0-inch Full HD touch screen which is very adaptable for watching movie DVD on it. It will carry the newest Android 4.4 KitKat system and it also will have 2GB RAM and 16GB storage capacity. This is the only one version we know for now. The benchmark of HTC M8 has reached to 36532 which is a very high score. So we can expect this upcoming device will have a much better performance. Also we can confirm that the processor this HTC smartphone equipped is the MSM8947AB version of Snapdragon 800 processor which has a better performance. Here are some of its superior features: GPU of higher frequency, upgrade for processor frequency, Level 2 cache frequency and ISP frequency. However, there is no upgrade for the camera configuration on HTC M8. It will adopt the dual-camera which is of the same configuration as HTC One (M7): the front camera is of 2.1 mega-pixel and the back camera is of 4 mega-pixel. Meanwhile, this dual-camera setting seems to imply in some degree that there is no third camera existing on this device. That is to say that the thing appearing on the back of the device is not the rumored 3D camera and it should be the fingerprint reader. It is interesting that in Nokia’s patent infringement lawsuit against HTC, HTC M8 release date and the future name was unexpectedly released. According to the exposed court documents content, Nokia cited evidence suggests that the next-generation HTC flagship will release in the first quarter of next year, and possibly in February 2014. Meanwhile, in this patent litigation lawsuit, in order to better demonstrate the development process of HTC smartphones in court, the judge had to expose the name of the device – HTC One 2 before it is officially released. Also the overall roadmap is very important for the final judgment in the case. 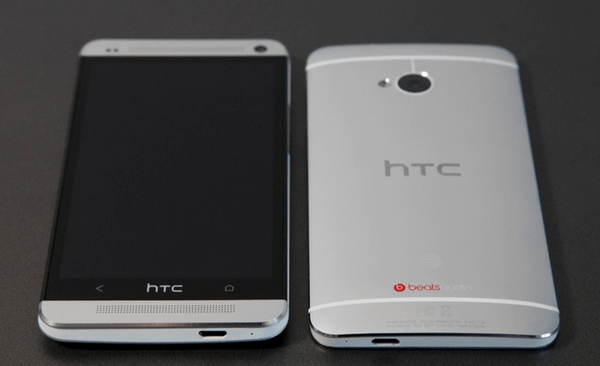 Nevertheless, since this device has not yet been officially released, we still can not confirm the HTC M8 real release date and official name from rumors and document files. The HTC official may change the release date and name before the official release. So let’s expect more released information about HTC M8. About Author: Lacey Young is an editor of Drm-Assistant.com and she has a wide range of knowledge of technology stuff like smartphone, computer, etc. She also likes to provide tips for readers. According to her, a DVD ripping software can copy movies from DVD disc.